Dave G. Houser is a favorite among travel editors for his ability to deliver high quality storytelling and imagery. For a complete list of publication credits, click here. To view samples of his published self-illustrated travel articles, click here or scroll down. Greenland, Global Warming's Poster Child. Discover scenic byways, awesome views and ancient cliff dwellings in America's original wilderness area as writer-photographer Dave G. Houser explores the region in his Winnebago Vista with his brother, Al. One of the best known beach escapades on the planet has just gotten better. From balmy shores and diving spots to World War II relics and near extinct birds, forgo cheesy casino-on-water setups and read about a real island hopping cruise to Melanesia and the Solomon Islands on the luxurious Orion. 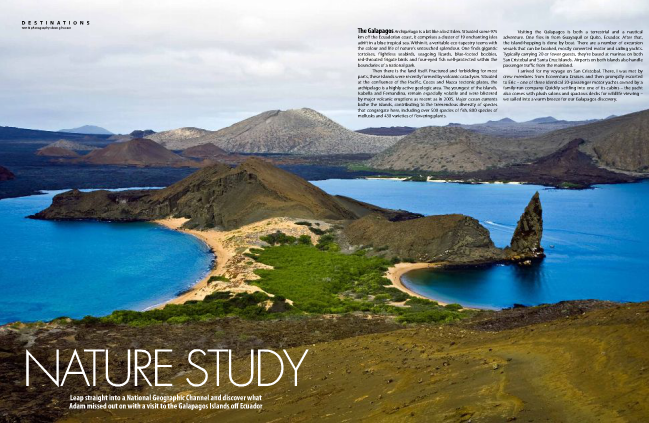 Jump straight into a National Geographic Channel and discover what Adam missed out on in the Galapagos Islands of Ecuador. Mongolia: Wilderness Unlimited. Join Dave G. Houser as he adventures into the land of the awesome Gobi Desert, valley of the world's largest dinosaur digs,and home to the proud nomadic descendents of Genghis Khan.